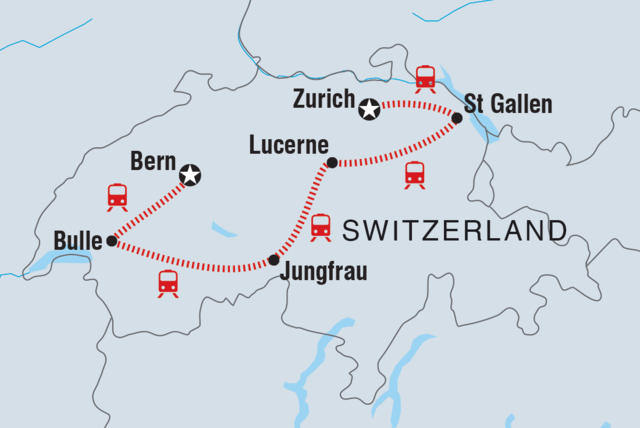 Switzerland is internationally renowned for the three Cs: chocolate, cheese and clocks. But there’s a lot more to this little country, nestled in the heart of Europe. Think awe-inspiring landscapes, majestic mountains, charming towns and so much more. In every destination we visit we strive to respect the environment and the local communities as much as possible. Hence our choice to travel by train, the most environmentally friendly way of getting around. From Zurich to Bern, via Lucerne and Lauterbrunnen, we try to limit our carbon emissions and avoid the use of private transport where we can. In Switzerland, there’s not really a need for this anyway and some villages, like St Gallen, even have a traffic-free historical center. Our hotels are always centrally located so you can get to points of interest on foot further limiting your carbon footprint. Swiss people are very focused on the environment and are major role models for all other European countries. Solar panels are easily spotted on the roofs in every big city and small town, people take pride in recycling and strong environmental laws protect their nature and population. This trip was carefully crafted with the help of the Swiss tourist board. By working together we’re able to show people a relatively unknown side of the country. St Gallen and Bulle might not be as famous as places like Zermatt, but they’re just as quaint and naturally beautiful. When researching your trip, you’ll probably read a lot about the purity of Swiss water. With more than 1,500 lakes Switzerland contains 6% of Europe’s stock of fresh water. We encourage our travelers to bring reusable water bottles with them and provide one to people that don’t have them. Our leaders avoid and discourage buying plastic bottles. Drinking water fountains are everywhere too, making refilling a doddle. An amazing way of exploring the country without having a huge impact on the environment is by bike. Or even better, by e-bike. Bern is the most cyclist friendly city you could ask for. Bike paths are widely available and even riding uphill becomes easy on an-e-bike. When in Bern, you will ride around the old town, visit Einstein’s house, where he developed the Theory of Relativity and enjoy a picnic with your fellow travelers. We also try hard to ensure that we stay in environmentally responsible accommodation. Our hotel in Bern has a beehive on the roof, and the busy bees’ activities can be viewed through a glass window eradicating the fear of being stung. The introduction of the beehive was in response to the alarming death rate amongst bees due to pesticides, lack of rural plant diversity (loss of wildflowers) and parasites. This is alarming as 80% of plant species owe their existence and continued evolution to pollinating insects. A third of the world’s fresh produce is the result of the work of bees in their role as primary pollinators. We always aim to benefit small business owners, like little family restaurants and small properties owned by locals, rather than big chains. We schedule our departures to try and avoid peak times for the operators, with the aim of tackling overtourism, which can be a problem in places like Lucerne. We keep the size of our groups small, max. 12 people, to try and keep the services manageable for the suppliers. We choose our partners based on their values and the clear actions they take to put those values into practise every day. We support artisans and local craft makers. An example of this is the visit we pay to Lucerne local craft market on day three of this trip. Our approach to local communities can be seen in some of the activities chosen for the itinerary: the visit to St Gallen library, for example. The entire Abbey precinct was declared a UNESCO World Heritage Site in 1983, and the Abbey Library hosts a collection of medieval texts and important documents dating back to the 8th Century. The income from the visits goes to the communities. Many travelers don’t know about the existence of this precious piece of history of mankind. No trip to Switzerland would be complete without a cheese tasting. When in Bulle, we visit La Gruyère, one of the oldest cheese factories in the country. The cooperative was created because of the demand for the promotion of local produce, and of the Gruyère in particular. To this day, twice a day, 30 to 35 local farmers, depending on the season, deliver their milk to the fromagerie (cheese dairy), from cows that graze on the lush grass and fragrant flora of alpine meadows. They supply more than six million litres of milk processed into Gruyère AOP. Under the watchful eyes of visitors, the master cheese-makers and their team produce up to 48 wheels of Gruyère a day, observing the stringent AOP (appellation d’origine protégée) specifications. Last but not least, the chocolate, one of the most delicious milky treats around. In Bulle there is a local Maison Chocolatiere, a chocolate factory founded in 1796 and named after the founder family name, Callier. Callier is Switzerland’s oldest chocolate brand still in existence today. We visit the factory and learn some of their secrets, before an indulgent tasting session.